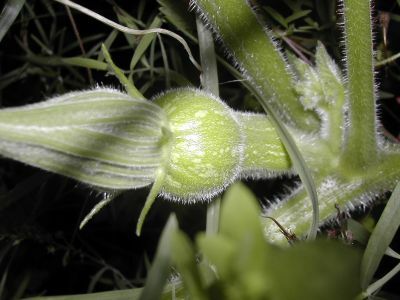 Well, the comments consensus for the identity of the triffid was either a pumpkin or a watermelon. But I looked at it this morning and there are a few small fruits on it. I think this looks like a courgette after all! This is more or less actual size so it has some growing to do yet… if the slugs don’t take a fancy to it first. I believe courgette flowers are a big delicay Liz. Do you eat them? I learn so much from reading blogs! I was unfamiliar with the word “courgette” so I googled and discovered it is what we call, in the US, zucchini or summer squash. Looks like it may be the bottle-shaped variety that turns yellow. That would be our summer squash. Saute with garlic and dill–yummy. 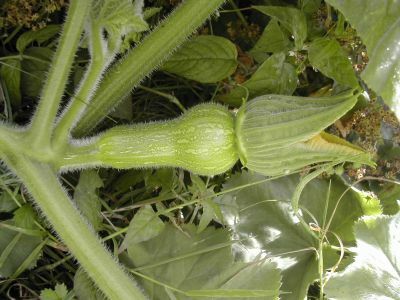 Hi Liz, mine are definatly pumpkin but yours I am thinking more of a courgette plant….I wonder?